In airless spray, the fast moving, high-pressure liquid stream provides the energy necessary to overcome the fluid’s viscosity and surface tension to form a fine spray. A simple, everyday example of an airless spray system is a bathroom shower. In an airless system, fluid is pumped under high pressure through a spray tip; the tip size and pressure determine the material flow rate. The tip also creates the fan pattern. Airless is in contrast to air spray systems, which inject compressed air into the fluid stream of a fluid such as paint to achieve decomposition. Speed: Airless spraying is up to four times faster than brushing or rolling, enabling more jobs completion in less time, and reducing labor costs. Quality: Airless sprayers produce an even coat of paint on all types of surfaces, leaving a high quality finish. Flexibility: Airless sprayers is also used for a wide range of coating materials, including interior and exterior jobs, and is easily transported from job site to job site. While the fluid section, pressure controls, and power sources are important components of airless sprayers, if one refers to the pressure controls as the “brains” of the system, then the airless spray tip is definitely the heart of the system. An airless spray tip helps determine the fluid flow or the amount of coating applied, and determines the spray pattern (i.e. fan width).All Graco airless sprayer tips are made out of the highest grade of tungsten carbide, the most abrasive-resistant material used for airless spray tips. Selection of the correct tip is essential to maximize productivity, as the tip determines the fluid flow and the size of the spray pattern – the fan size. Using the right tip results in maximum control and minimum overspray, which means faster work and less paint usage, which ultimately means finishing the job quickly without wasting paint. To choose the right spray tip, several factors are important to considered, such as the material thickness, the sprayer’s maximum flow rate and the best fan size for the job. It is important to know when a tip is worn and why to replace it. For optimum performance, the sprayer must have a maximum flow rate higher than the flow rate of the tip, so be sure the flow rate of the tip is less than the maximum flow rate of your sprayer. For example, a 15 thousandths tip (.015) has a rating of 0.91. Hence, the sprayer must be capable of pumping at least 0.91 lpm. Why use a tip with a lower flow rate? When the tip wears, the opening becomes larger, and the flow rate increases. It’s easy to determine which tip size to use when you know the type of material you’ll be spraying. Lower stickiness (thinner) materials, such as stain or coating, require a spray tip with a smaller hole size. Heavier materials, like latex, require a tip with a larger opening. Extremely heavy materials like elastomerics and blockfiller might require spray tips larger than .035. Fan size – the width of the spray pattern – determines the area covered with each pass. For a given tip orifice, a wider fan delivers a thinner coat, less defined spray pattern, more overspray, and faster coverage on broad, open surfaces. A narrower fan delivers a thicker coat, more defined spray pattern, less overspray, and better control when spraying small or confined surfaces.To maximize productivity and reduce labor costs, choose a tip with the right fan size. In general, a larger fan size increases production with less control, and a smaller fan size decreases production with more control. Spray at the least amount of pressure necessary to atomize material. Strain the coating material prior to spraying, using a nylon strainer bag. Clean filters after each use. Use a soft bristle brush to clean tips. 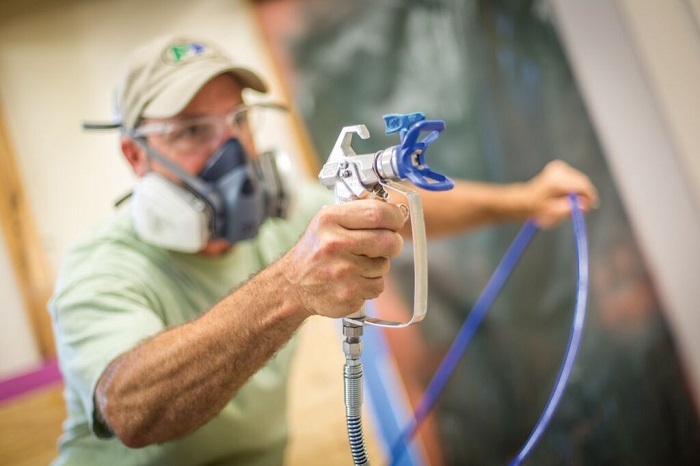 The types of materials you spray will determine the size of the tips you use. If you plan to spray a variety of materials you have to consider buying a sprayer with greater versatility.Will you be spraying on dry wall, exteriors or concrete? You have to consider the tip sizes needed as well as the quality of finish required in order to choose the best sprayer for the job.Each job has its own requirements. New construction, residential work, and commercial jobs vary in terms of coatings used, crew size needed, and power source available. Purchasing a part-time sprayer to do a full-time job has disappointed many contractors. In the long run, saving money on a sprayer that is inadequate for the job, or not durable enough, is costly in terms of lost labor. If you plan to use more than one gun at the same time, then you have to purchase a unit that has the ability to handle multiple guns. Hose length depends on the job site, material being sprayed, tip size, and hose diameter. Your sprayer must be able to support the length of the hose. Most Graco sprayers use DC motors, which are able to support longer hose lengths than either AC or universal motors. Buying a sprayer is an investment. You don’t want to over-buy or under-buy. Keep in mind the cliché, “You can pay now or later”. Downtime resulting from an undersized, overworked sprayer or poor quality equipment can quickly wipe out any savings from the initial low purchase cost of the sprayer. The spray gun is held approximately 30 cm from the surface, and aimed straight (both horizontally and vertically) at the surface. Extremely large tips will require you to move further away to achieve a good spray pattern. The spray gun should move across the surface with the wrist flexed to keep the gun pointed straight at the surface. “Fanning” the gun to direct the spray at an angle will cause an uneven finish. The spray gun should be triggered after beginning the stroke (also call the lead stroke) and released before ending the stroke (also called the lag stroke). The gun should move during both the trigger squeeze and trigger release. This technique prevents patches of thick coating at the beginning and end of each accomplishment. This technique ensures that an even amount of coating has been sprayed onto the surface. The spray gun should be aimed so that the tip points at the edge of the previous stroke, overlapping each stroke by half. To maximize efficiency when spraying on broad, open surfaces (e.g. ceilings and bare walls), the outside edges of walls should be sprayed first. The middle can then be sprayed quickly, requiring less precise strokes. When spraying corners the gun should be aimed into the corner, spraying along the corner, rather than spraying back and forth across the corner. Move the spray gun faster. Choose a smaller tip: ensure the sprayer is rated to handle the size tip being used. Choose a tip with wider fan. Make sure the spray gun is far enough away from the surface (30 cm). Move the spray gun slower. Choose a tip with a narrower fan. Make sure the spray gun is close enough to the surface. Many different components need to be checked, tightened, cleaned or replaced as needed: inlet screen, manifold filter, gun filter, tip filter, hose connections, inlet suction tube, gun body, tip guard and tip, trigger safety, trigger guard and power cord. The appropriate size filters should be used for the material being sprayed. Filters should be checked daily; if clogged more than 20%, replace. If punctured, replace immediately. Visually check hoses every time you spray for internal build-up, cracks, kinks, holes, blisters, abrasions, and damage to the hose cover. Use two wrenches when tightening all hoseconnections. Check conductivity of hose once per quarter with an OHM meter. Conductivity is important to dissipate static electricity build-up at the gun. Ensure good airflow path into motor; wipe shroud clean after each use. Do not cover the pump with a rag or plastic while spraying; allow good airflow to keep the sprayer cool. Don’t pressure wash the unit. Wet cup/brass packing nut tightened. Fill cup with Throat Seal Liquid (TSL) every time you spray to reduce paint adhesion on the rod. Do not use oil as a substitute for TSL. If raw paint appears on the pump rod, tighten packing nut 1/8 turn or until weeping stops. When pump packings wear, paint will begin to leak down the outside of the pump. Replace pump packings at the first sign of leaking or additional damage could occur to the expensive pump hard parts. Clear tips with a couple of short bursts of water or solvent. Clean tips with a soft brush. Store tips for short periods in a sealed container of water or solvent. Replace tips if worn more than two tip sizes. In cold climates, don’t allow water or paint to freeze in internal parts or the hoses. Expansion as water freezes can cause severe damage. Bring your sprayer in annually for a general service check at an authorized Graco repair center. Do a dirty rinse and a clean rinse, another rinse with clean water or thinner, with a minimum of five gallons of rinse fluid. Store your system with the pump rod in the down location. Less exposure to air will reduce corrosion. Do not store the unit under pressure. To prevent fluid from running out of sprayer during storage, fasten a plastic bag over suction tube when not using sprayer. Install and use proper ventilation. Remove or extinguish all ignition sources, such as pilot lights, cigarettes, arcing motors, and others. Ground all people, objects and spraying equipment in the spray area to prevent electrostatic discharge. Use appropriate flushing procedures: use water, mineral spirits or lacquer thinner. Never use gasoline! Use only grounded outlets, extension cords, and fluid hoses designed for high-pressure spraying that are in good condition; do not modify or remove electrical cords. Spray equipment users and doctors often underestimate the seriousness of a skin injection injury and the medical complications that could result. The injury might look like “just a cut” but should be considered a serious injury! Stay clear of high-pressure fluid streams and sprays. Never remove protective devices, such as spray gun tip guards. Use proper flushing practices described in instruction manual. Never try to stop leaks with your hands or body. Always use the spray gun trigger safety when not spraying. Don’t feel for leaks with your hands or a rag. Pressure-related injuries occur when equipment is over-pressurized and a component of the airless sprayer ruptures. Exceeding the safe working pressure of a component leads to component ruptures; continued use of worn or damaged equipment; or the operator fails to follow pressure-relief procedures. In addition, injuries can occur if connections are not tight, are incompatible, or are inappropriate for the pressure rating. Do not exceed the working pressure ratings (WPR) of components, paying special attention to high-pressure equipment. Use pressure-relief devices like pressure relief valves on sprayers. Limit the air or hydraulic pressure to the motor so that the fluid pressure produced by the pump is less than the working pressure of all system components. Do not repair permanently coupled hoses. Properly align spray tips to prevent back-spray. Do not use low-pressure fittings on high-pressure equipment. Do not use damaged or worn equipment. Check for proper connections and make sure they are tight before pressurizing the system. Injury from moving parts most often occurs after unintended contact with moving components (for example, air motor and pump displacement rods). It can also occur if equipment guards are removed, or failure to completely relieve fluid and air pressure on servicing equipment. To prevent injury from moving parts, follow procedures for relieving fluid pressure whenever you stop equipment for service or repair. Never operate equipment with guards or other protective devices removed, and check regularly to ensure that safety devices are operating properly. Finally, properly use bleed type shutoff valves. Properly ground all objects in the system, including operators. Follow the procedures in instruction manuals to avoid shocks from electrostatically charged components. Never operate electric equipment when it is wet or when the surrounding area is wet. Use only grounded outlets, extension cords, and fluid hoses designed for high-pressure spraying that are in good condition. Do not modify or remove electrical cords.